Heat oven to 250°F (120°C). Spray two 15x10-inch (38x25 cm) baking sheets with non-stick cooking spray. In large bowl, mix oats, cereals, walnuts, almonds and sunflower seeds. In 2-qt (2 L) saucepan, cook brown sugar, oil, honey and water over medium-high heat 3 to 5 minutes, stirring constantly, until brown sugar is melted. Remove from heat. Stir in vanilla and almond extract. Pour over cereal mixture; stir until well coated. Spread mixture evenly in pans. Bake 1 hour, rearranging pans once halfway through baking. Cool completely in pan, about 1 hour. Break into pieces. Store in tightly covered container. 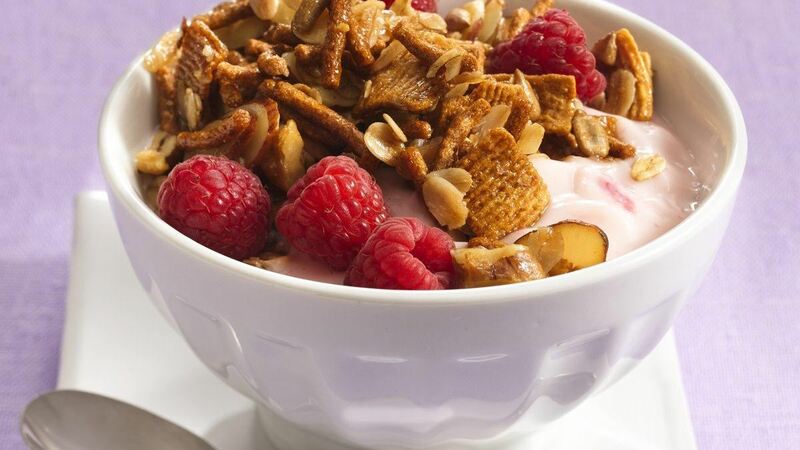 Serve as breakfast cereal, snack or as topping for ice cream, yogurt or fresh fruit. Kitchen Tip: For a great teachers gift place granola in a tightly fitted decorated container.